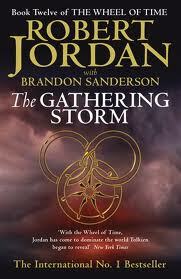 The Gathering Storm (Wheel of Time, #12; A Memory of Light, #1) was partially written by Robert Jordan before his death in 2007. Brandon Sanderson was chosen to take over and he has done a masterful job. The book is in short - great. I must admit, I think this is one of the best of the entire series. Why? Probably because of Sanderson. His way of writing is a bit different from Jordan's and to be honest, for me, it's easier to read. Jordan's first 11 books are very heavy. This one had an entirely different feel to it. Jordan has been accused of in his later books of losing track of characters' personalities - especially the females got very one-sided. Sanderson brings back life and humanity to them all. Without spoiling anything I can tell you this book focuses mainly on Rand's battle with himself, Egwene's battle with the White Tower and then a few chapters from Perrin's, Matt's and even Aviendha's point of view. With the exception of Matt who feels a bit odd, they are all so deep now - and not in a bad way. They just have more layers than one. Every chapter in the book is an action one. Unlike previous books in this series, you don't find yourself wondering when there'll ever happen something again. Every chapter something happens and I love it. Yes it's very obvious that this is the last books now, time to tie strings up and narrow things down, but damn! I sat there whooping and laughing as some things happened and some people were dealt with. I groaned as somethings majorly widened the plot only to have it narrowed back down in the next chapter as our hero or heroine took control. Obviously the story doesn't end here. This is the first of a trilogy in some ways. The last book was supposed to be just that - the last. But Sanderson found that Jordan had left so much material behind it would be a massive book of 750 000 words. So they split into three - The Gathering Storm was the first. The next book in the series, Towers of Midnight, is expected in late 2010, possibly November 2nd - I can't wait! I got up to number 7 in this series about two years ago before giving up and now they're in mum and dad's loft. Maybe one summer I will read all of them .... do you think it's worth it? Well I definitely think they're worth the read. Jordan's books are very heavy and they are really a matter of either or when it comes to whether or not you can stomach them. It took me about a month per book the first time I read them, because they were just so heavy (and I was young-er) but it's a story I wouldn't have gone without definitely. I think you are most definitely right - probably time to get the books out of the loft!